Lady Windemere's Fan at Langham Court Theatre. A review. You are here: Home / Arts / Lady Windemere’s Fan at Langham Court Theatre. A review. The volunteers at Langham Court Theatre have devoted countless hours preparing Lady Windemere’s Fan for the stage, and it shows in all aspects of the current production. Sets are beautiful, costumes exquisite and the acting a strong example of excellent ensemble work, with shining moments of drama, wit and comedy. The legendary Oscar Wilde, essayist and social critic, wrote Lady Windemere’s Fan in 1892; it was staged for the first time shortly thereafter to great critical acclaim, and an acting edition published by Samuel French in 1900. For over 100 years it has been produced by professional, amateur and community groups, and still resonates with contemporary audiences. Set in high-society Victoria England, within the construct and cadre of popular plays of the day, it allows Wilde to develop his philosophical ideas. Lady Windemere’s Fan can be appreciated as simple entertainment, or provide pause for reflection without the weight of many morality plays. 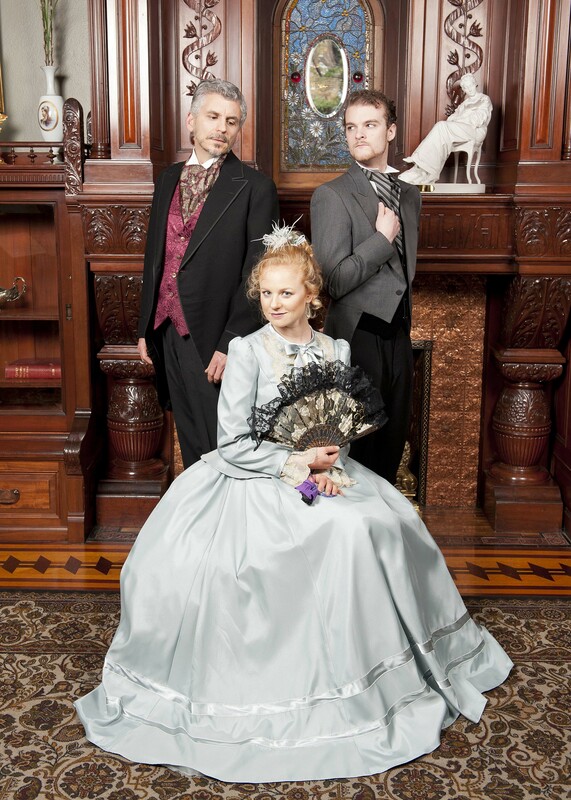 Michael Romano (Lord Darlington), Morgan Ambrose (Lady Windermere), Adam Holroyd (Lord Windermere). The eponymous Lady Windermere (Morgan Ambrose in her first stage role) is a “good” woman, with very clearly defined principals and values, celebrating her coming of age. To her great dismay, upon a visit by the Duchess of Berwick (Elizabeth Whitmarsh as a social climbing, over bearing stage mother) she discovers that her husband may not be as faithful as she believes, and has been keeping company with a woman of ill-repute, Mrs Erlynn (the assured and rather dastardly Wendy Magahay). The setting may be completely foreign, but the moral dilemma is not – what do we do when our clearly held positions are challenged? And how do we negotiate the compromises necessary to live in society with others? Director Angela Henry deftly guides her accomplished and large cast through intimate moments and large crowd scenes. Morgan Ambrose’s Lady Windemere has steel in her spine, and manages to convey, with great natural ability, the agonizing moment when you must maintain your composure as the world disintegrates around you. The pace of the production allows Wilde’s repartee to be showcased in a way that is easy for the audience to follow. In the ballroom scene, the action pauses to highlight conversations between the guests, much as a voice over might in a movie, or a pull quote in a magazine article. The Victoria Theatre Guild and Langham Court Theatre have an enviable reputation for their costume loft, carefully accumulated over 84 years, and the quality of the workmanship of costume designers, costumers and assistants. Nowhere is this more evident than with the current show. A large cast of 25 is provided with elegant day wear and elaborate evening attire. In addition, a hair designer (Danielle Bennett) was enlisted to create coiffures, and wigs, courtesy of the Victoria Gilbert and Sullivan Society, were utilized where necessary. The London home of the Windemeres is simple but vast, with a handsome balcony perfect for quieter tête à têtes. Set designer Dan Thachuk manages, by very impressive legerdemain, to switch from Windemere Manor to Lord Darlington’s rooms. I’ve never seen a set change applauded before, and don’t want to share the secret for fear of spoiling the effect for readers of this review. High society proves to be not so very different from the rest of us, as this cast of notables gossips and back-bites their way to a delightfully happy conclusion. There is plenty of time for declarations of undying love from confirmed bachelor Lord Darlington (Michael Romano in a passionate and fiery performance), protestations of innocence from Lord Windemere (Adam Holroyd in his Langham début), scheming by Mrs. Erlynne, a budding romance between Hopper (Jared Gowen) and Lady Agatha (Brighde Penn). Wilde’s views on women are shared by his characters, and highlighted at length in the second act, in Lord Darlington’s rooms. Lord Augustus (Carter MacDonald) would like nothing better than to be re-married, but is Mrs. Erlynne the right match? Together with Cecil (Alasdair Howie), Dumby (Mitch Barnes), Lord Darlington and Lord Windemere they give us a very realistic “behind the scenes” look at a life of privilege and wealth. Think locker room for theVictoria era. Lady Windemere’s Fan is a delightful period piece that succeeds aesthetically and dramatically, and provides proof, once again, that work from a past era can be relevant to today’s audiences. Parking is available on side streets: Pentrelew Place (across Rockland from the entrance to Langham Court) and Revercomb Place between Moss Street and Langham Court. If you don’t mind a longer walk, parking is always available on Moss Street between Rockland & Fort, and on Fort Street itself. Disclaimer: I was provided with tickets to the opening night of Lady Windemere’s Fan, and asked to provide a review. As always, I retain full editorial control over all content published on my blog.